We provide practical training for skippers candidates which will prepare you for your practical examination for certification. This can be conducted on your own vessel or our vessel can be hired for the training. 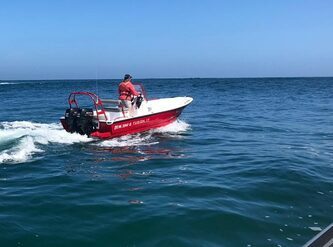 Our training vessel is a Fusion 17 with twin 30 Suzuki 4 stroke fuel injected engines. It has all the necessary equipment to make for a safe and enjoyable training experience. It is a Category C vessel and rated to 15 nautical miles. 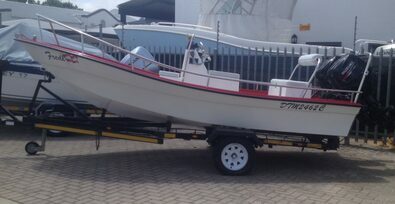 We have added a new vessel to our fleet, a 4.2 meter Ballistic with a Yamaha 60hp engine. ​This vessel will be used solely for surf launch training. This is a Category E vessel rated to one nautical mile. ​Our examiners are qualified to train up to 40 nautical mile coastal skipper for power. One of our team is also SAS examiner and can provide examinations on sailing vessels also.